11 March 2013. 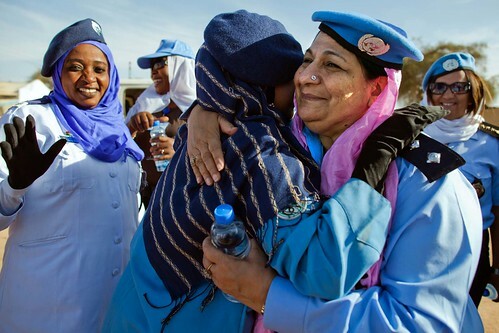 El Fasher: (right) UNAMID Police woman and responsible of the Police Women Network, Farkhanda Iqbel (from Pakistan) embraces a Sudanese Policewoman before participating at the march organized by UNAMID to commemorate the International Women's Day in El Fasher, North Darfur. With the slogan "Together to promote the dignity of Women and Girls", the event was organized in coordination with UNHCR, UNFPA, UNDP, UNICEF, UNWomen and the Government of Sudan.